Scotland have received a blow on the eve of their match with South Africa following Alasdair Strokosch's late withdrawal from the side. The blindside is struggling with a calf injury and has been replaced in the starting XV by John Barclay. Barclay will take up the openside berth while captain Kelly Brown will revert to blindside, with David Denton remaining at number eight and uncapped Edinburgh back-row Stuart McInally named among the replacements. The loss of Strokosch, who performed well against New Zealand, particularly in defence, is a blow. It is the third change from the side which began the 51-22 loss to New Zealand last weekend and second in the back row after Ross Rennie dislocated a shoulder and was replaced by Denton. Scotland head coach Andy Robinson said: "We wish 'Stroker' a speedy recovery. John is an experienced campaigner, while Stuart was with us on the summer tour and is raring to go." Scotland team doctor James Robson added: "Alasdair suffered a minor calf strain in training this week and while we were hopeful it would settle in time we believe his recovery has not been sufficient to warrant risking a partially-fit player." 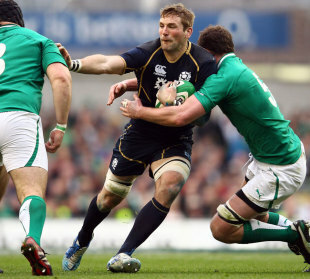 Glasgow Warrior Barclay, who was man of the match when Scotland beat South Africa in November 2010, will win his 40th cap. McInally has captained Scotland at every age grade and represented Scotland sevens and Scotland A.